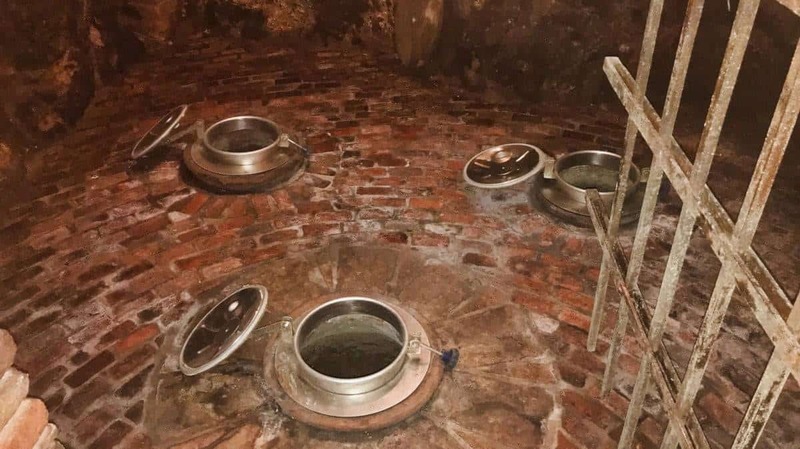 The people of Karst Slovenia have been making wines for centuries. The Karst wine region located in the southwestern part of Slovenia is lovely. 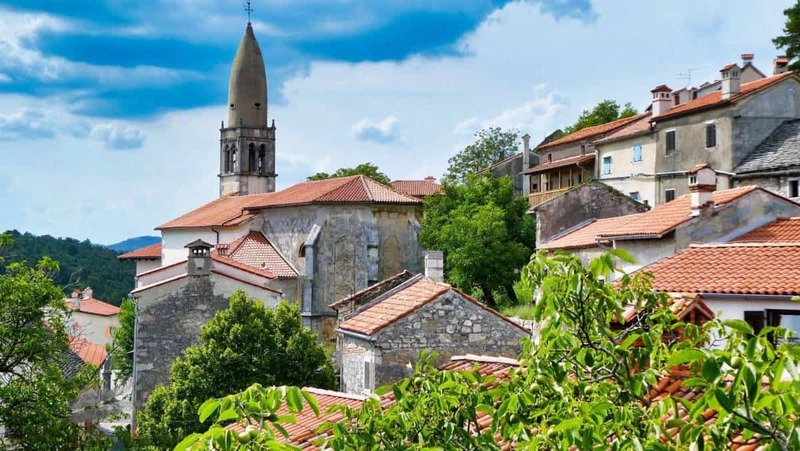 Affectionately called Kras by locals, northwestern Italy shares the Karst wine region with Slovenia. Karst is one of the few wine regions to share countries. Karst is actually a topography formed from the dissolution of soluble rocks such as limestone, dolomite, and gypsum. The Karst region in Slovenia is known for its underground drainage systems, sinkholes, and caves. Karst Slovenia has beautiful limestone cliffs, which are not far from the Mediterranean Sea. 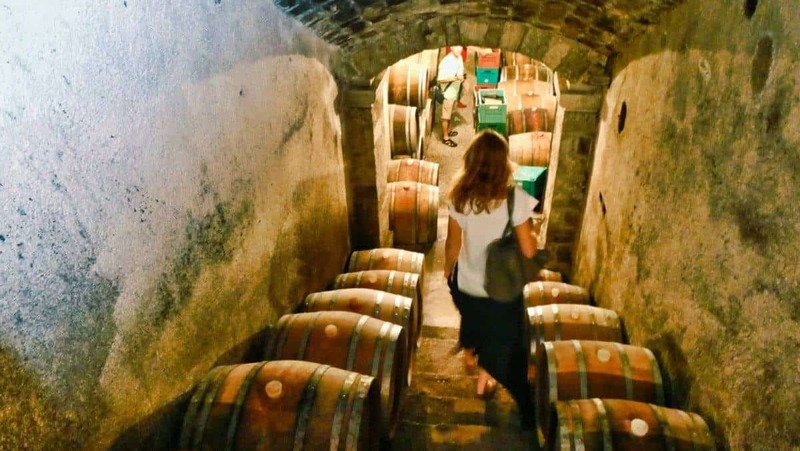 If you truly love wine, you must take a tour of the Karst Slovenia wine region. We took a private tour with Mojca, owner of Enjoy Slovenia. 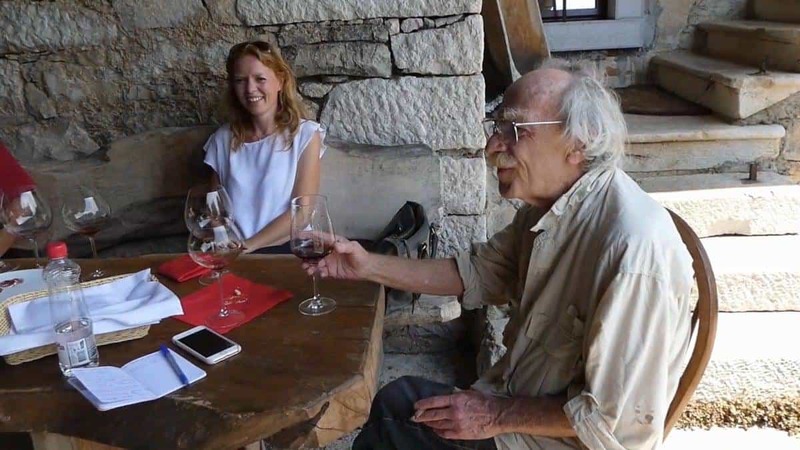 She is well connected in wine tourism and can design any Slovenian wine tour you desire. Mojca picked us up in Ljubljana in the morning. An hour or so later and we were in the picturesque wine region of Karst. During the drive, we learned about the region, its history, culture, and of course, its wines. We told Mojca we were looking for a premium wine tasting tour because we are true wine enthusiasts. We wanted to learn about Slovenian wine, and she suggested we add orange wine to our tasting also. Keith and I looked at each other and said orange wines? More on that to come. 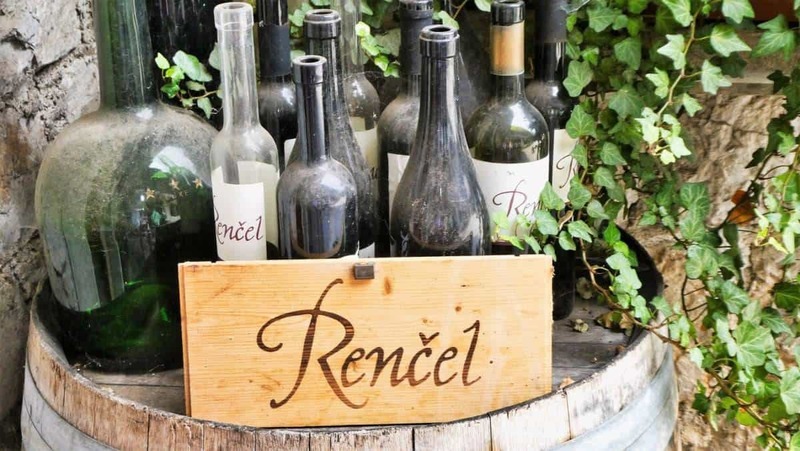 For our first stop of the day, Mojca took us to the boutique Rencel Winery in the city of Dutovlje located in the Karst wine region. 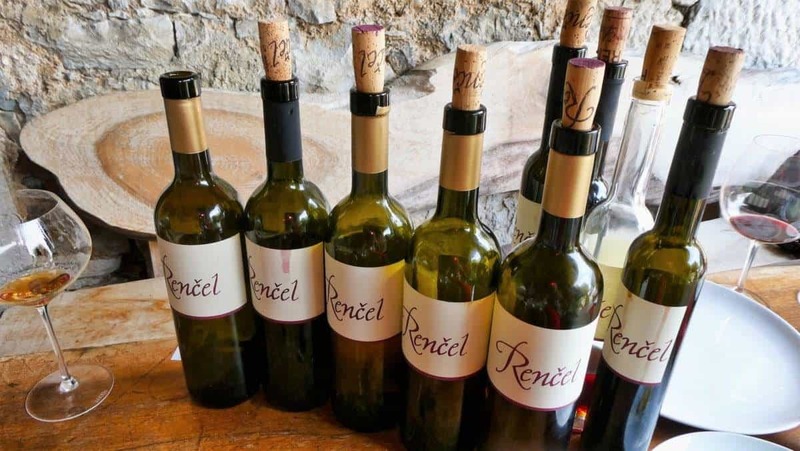 We discovered that Josko Rencel, the winemaker and owner is internationally praised for the high-quality wine he produces. It did not take long before we found out why. Let me back up and paint a picture for you. For Keith and I, our love affair with wine really took hold when we lived in California. We fell in love with visiting beautiful wineries and tasting wine. 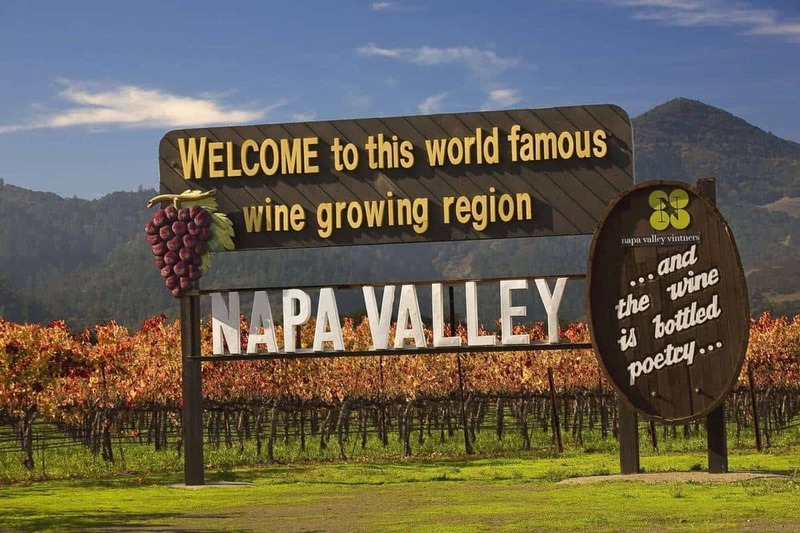 We’ve tasted from southern California in Temecula to as far north as Napa and everything in between. Besides the great wines we’ve tasted, we love the people we meet. We feel wine tasting is a culture all in its own and that’s why we love it. Fast forward to Rencel Winery. We pull up into the driveway of a house. We walk through the gate and into the back yard. The yard had some grass but mostly weeds. A slightly ruffled gentleman who to us, looks more Italian than Slovenian, comes out of the house, greats us in Slovenian and Mojca translates. He is wearing a maroon polo shirt and slacks, and it is obvious by the condition of his clothing that he has been hard at work for hours and it’s only 10 a.m.
Our wine tasting began with a non-macerated (without skins) Pinot Noir or a white Pinot. As we drank our wine, we learn that the picturesque Karst area of both Slovenia and Italy is mainly farmland with iron-rich soil. We learned that most of the farmers are winemakers. The wines produced in this area are unique since the soil contains a lot of limestone and iron and because of the regional proximity to the Mediterranean. 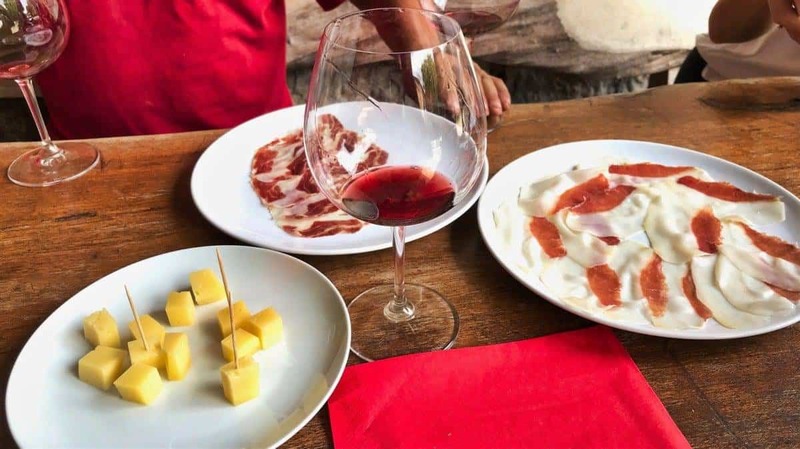 It’s famously known as “terra rossa.” The notable wine of the Karst region of Slovenia is the Teran, a full-bodied red (almost black in color) made from Refosco grapes. Also grown here are Vitovska Grganja grapes which are an old local grape variety that produces a dry white wine. It is popular in this area because it produces a large cluster of grapes, a substantial crop, and grows well in Karst. And then there is Malvasia which is a Mediterranean grape that grows well in Karst and produces a moderately dry white wine. Also produced in Karst are a few sparkling wines. After chatting, eating some cheese and prosciutto, and tasting six beautiful wines, a friend of the winemaker pulls his car into the back yard. A tall Serbian man in a crisp white shirt and black pants walks over to the table. He hugs our winemaker, and they talk for a minute. The man introduced to us as Pope takes a seat. Pope’s introduction is the moment the “Anthony Bourdain experience” begins. He is apparently a very good friend of our winemaker. Pope stopped by because he has a new sausage he has discovered and wanted to share with our winemaker and us. More wine flows and stories commence. Our guide Mojca and Pope translate whenever Josko speaks. 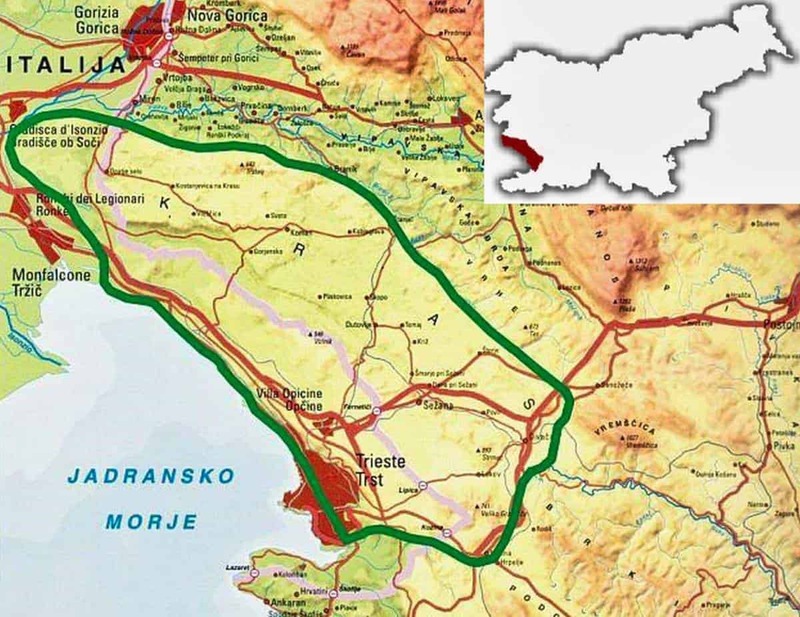 We learn that Pope has a second home not far from Rencel and owns a popular restaurant in Ljubljana called As. Pope also makes wine but on a smaller scale. At about this time we are tasting orange/natural wines. Orange wine was a first for us; we had never seen or tasted orange wine. Orange wines are not wines with scents or hints of orange, but rather they get their name from the orange hue of wine. Furthermore, as Pope and Josko explain, orange wine is made from white grapes, mashed up and put in large ceramic vessels. The grapes are left anywhere from several days up to a year. They put the whole grape in these ceramic vessels with skins and seeds too. Pope is a huge fan of orange wine. Orange winemaking is a very natural process that uses little to no additives, sometimes not even yeast. Because of all this, they can taste very different from regular white wines. Keith and I favor reds, but we love all wines. Moreover, after tasting these orange wines, we can continue to say we love them all. So basically, they make orange wines with white grapes but with the skins on similar to red wines. Leaving the skins on gives orange wine a structure similar to reds from the tannins. So how do orange wines taste? They are not as bold as cabernets, however, for white wine; one would say they are somewhat bold. Some of the orange wines we tasted were fruity like apricots, peaches or nectarines. Others had a rich honey flavor, but they were not sweet. All the orange wines we tasted had a velvety mouth-feel, which I love. When I ask a sommelier in a nice restaurant to recommend a wine, I am usually asking for a red, and I ask for one that has a smooth, velvety mouthfeel. Unlike a true white wine, you can drink orange wines cold or at room temperature. However, the suggested best temperature is 55 degrees Fahrenheit. Keith and I thought this was a new wine discovery, but as Pope explained, orange wine appeared over 6,000 to 8,000 years ago, not too far from Slovenia, probably in Georgia. Josko explains winemakers, like himself, are bringing this ancient wine technique of orange wine into the modern age. Pope explains that people who favor natural wine have embraced these wines. But they are controversial and not for everyone because they can be, well, really odd to our modern palates. So people either love them or hate them. 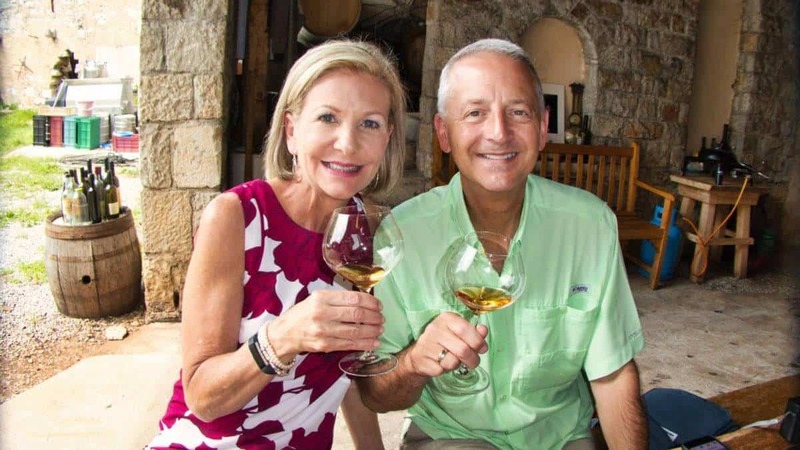 For Keith and I, orange wines are not quite reds and not quite white wine but structured like red wine, and fresh, and we say they are worth investigating. 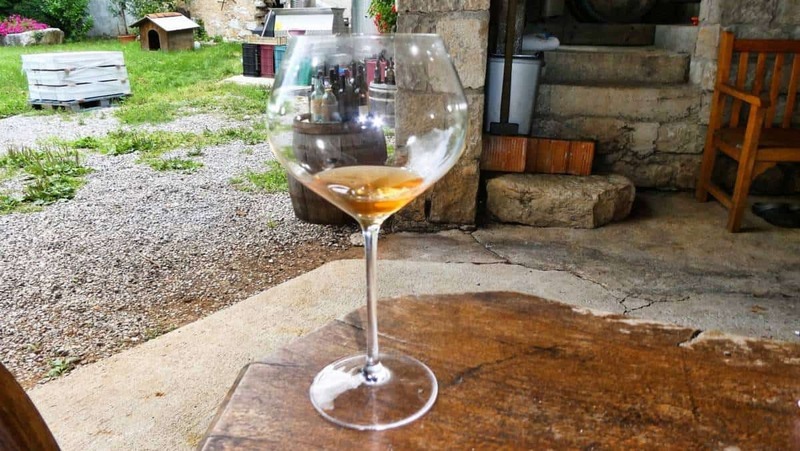 I think most American wine lovers are looking for something new and even though they are not new, orange wines are the new kid on the block in the US. If you find an orange wine in the US especially from the Balkans or the Caucasus regions, try it! As our wine tasting progressed, we tasted 16 wines and a port. Josko invited his neighbor over to meet us. His neighbor used to live in California, and so did we. His neighbor came on a vacation to Slovenia over ten years ago and fell in love with the country and has never returned home. Oh, and this guy, ran for governor of Califonia in 1978. Unfortunately, he lost. So this wine tasting that Keith and thought was a bit sketchy at first turned out to be the best wine tasting ever. We drank great wine, we had a great, lively conversation and we made new friends. Speaking of new friends, our new friend Pope invited us over to his house to show us his wine cellar. His family was one of the winemakers on the Titanic. He still makes the same wine. We got into Mojca’s car from Enjoy Slovenia and followed Pope to his home. The house sits amongst his vineyard. 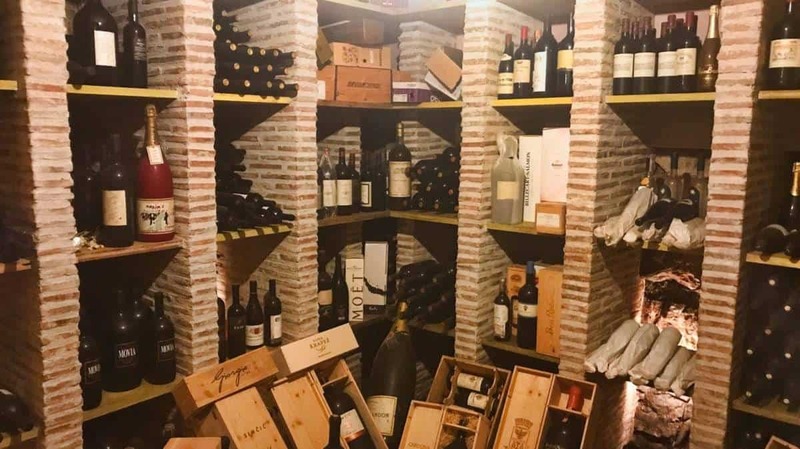 The first place we visited was his wine cellar. Like I said he comes from a long line of winemakers. Pope makes much of his wine in clay amphoras. The amphoras buried in the ground in his cellar looked foreign to us. We tasted the wine they served on the Titanic. The batch we tasted was 40 years old. It was actually quite good. 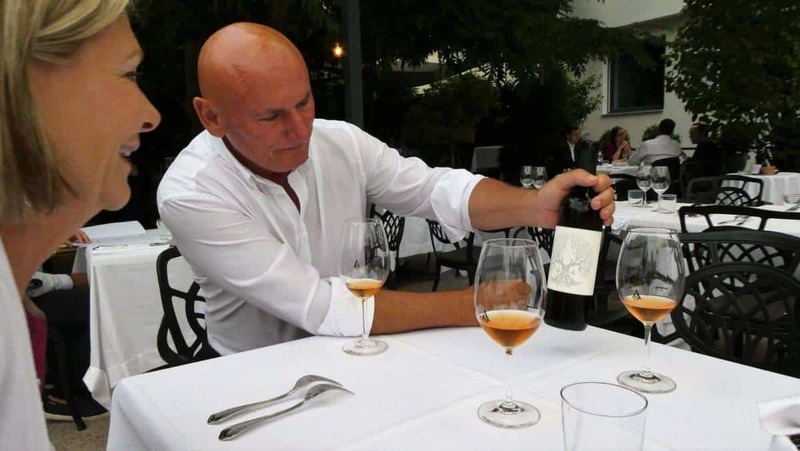 Pope makes much of the wine he serves at his restaurant in Ljubljana, and most of that is orange wine. After touring Pope’s house and cellar, we said our goodbyes and Pope invited us to have dinner with him that evening in Ljubljana at his restaurant As Restaurant. Of course, we said yes! Incidentally, “As” means ace in Slovenian. After the first wine tasting, we needed lunch even though by now, it was way past lunchtime. We had lunch at our next stop at a restaurant called the Grad Stanjel. 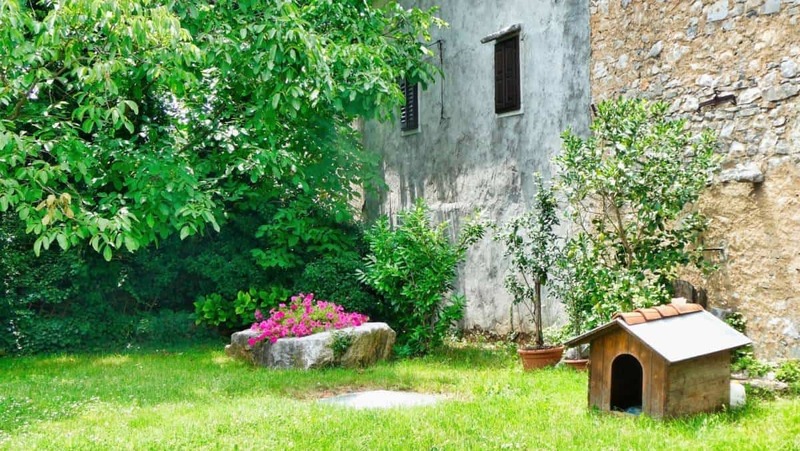 It was a small place not far from the city center of the medieval village of Stanjel. 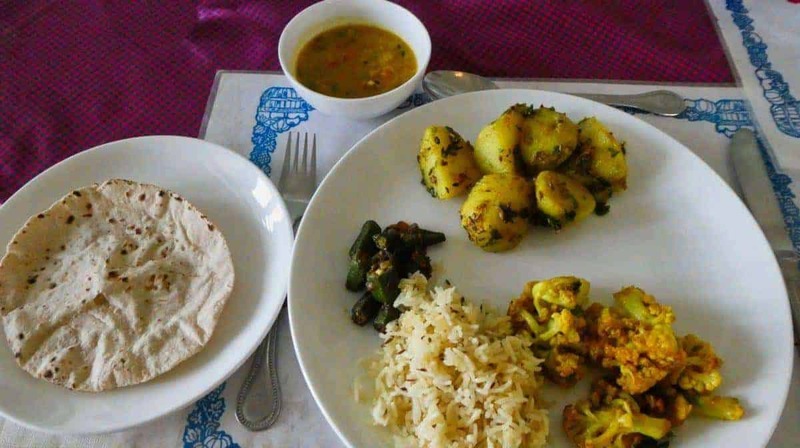 Our lunch made with local ingredients was fabulous. Grad Stanjel uses homemade, genuine and region-specific components, creating dishes you would think their Slovenian grandmas prepared. After lunch, we visited the medieval village of Stanjel, one of the oldest settlements in the Karst region. We had a private tour with Tom who is in charge of Stanjel tourism. He informed us that the village has 50 people living there today. This picturesque village on a hill is charming with its quaint and beautiful village center, rows of stone houses and it’s Ferrari Garden. The Ferrari Garden is a major landmark in the settlement, declared by Slovenia as a natural park and a national monument. Once an ancient Roman fort, the village of Stanjel stands proudly atop a hill; its location made it an important settlement in this area since the iron age. Walls built around Stanjel in the 15th century were fortified during the 17th century to defend against Turkish raids. Stanjel served as a base for occupying German troops during the second world war and was heavily damaged by Allied bombing at the end of the war. Since the war, the village has slowly rebuilt. One of the two big landmarks in the village is the castle of Stanjel. The castle built in the Middle Ages needed reconstruction at the end of the 17th century. The castle remains untouched since that time. The second major landmark is the Ferrari Garden. 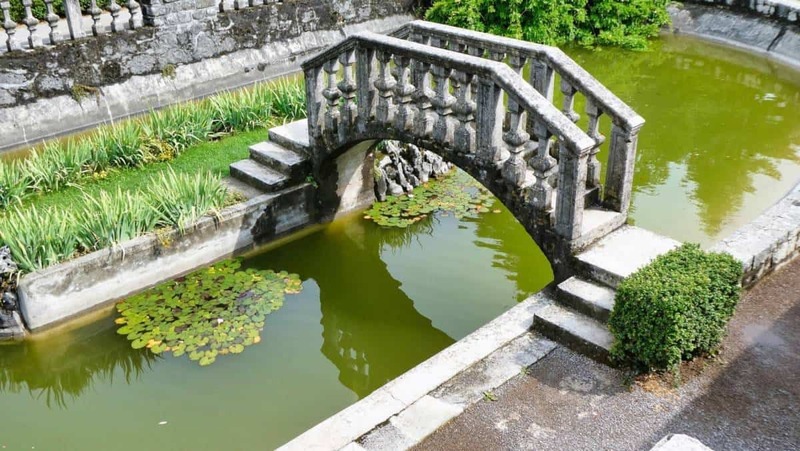 The garden, built in the 1920s is located below the village, next to a villa, and houses a small pool with an island connected by a bridge to the shore. 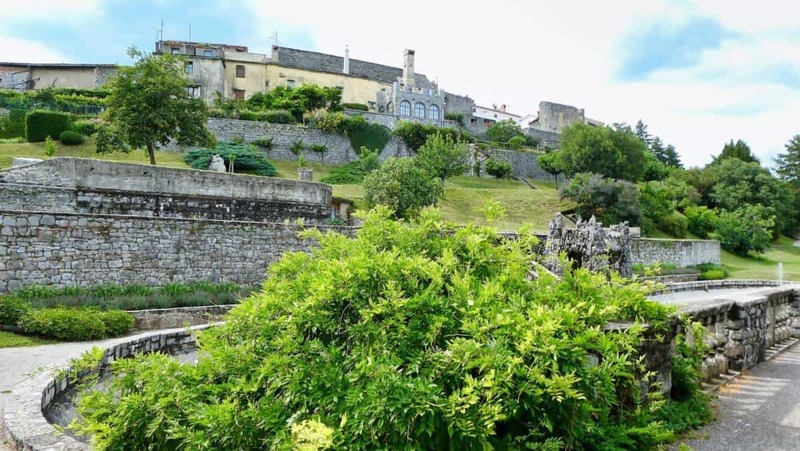 The gardens offer great views of the Karst countryside below. 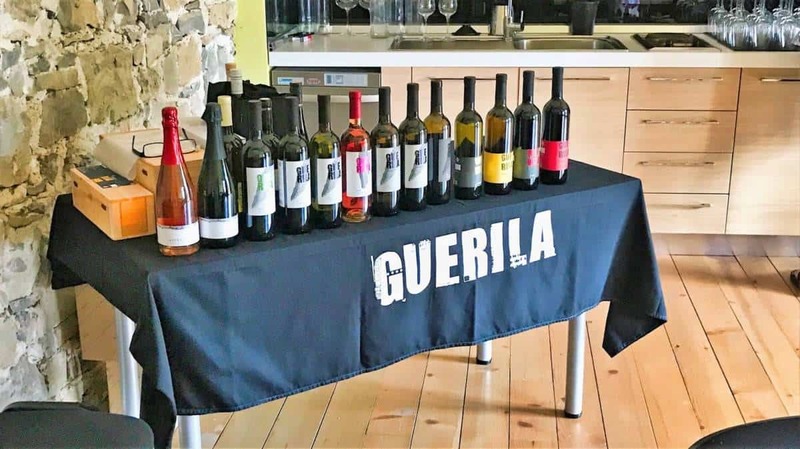 After our visit to the historic town of Stanjel, we made our way to another wine tasting at a premium organic Slovenian winery, called Guerila. Organic biological dynamic winemaking is a family tradition at Guerila. Care for the vineyard, and the environment is part of a love story according to the owner. 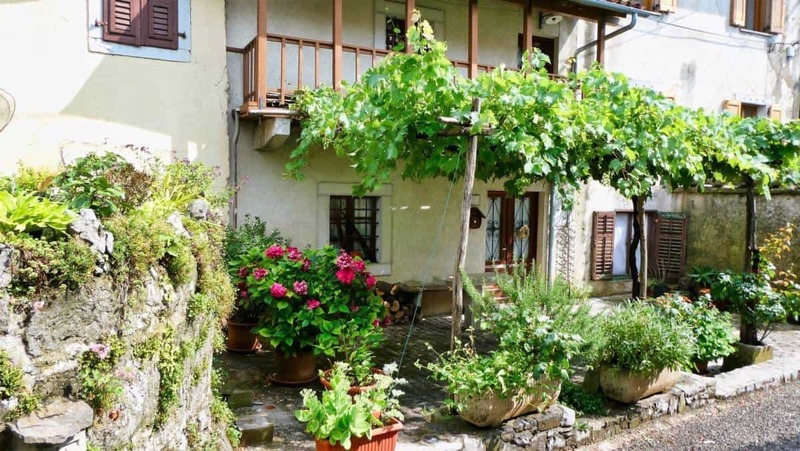 Guerila is a boutique cellar in the Vipava Valley wine-growing region. Tasting wine in the newly built tasting room with the winery owner, Zmago Petric, was a great experience. It was evident he loves being in the company of passionate individuals and even more so if they are wine lovers. 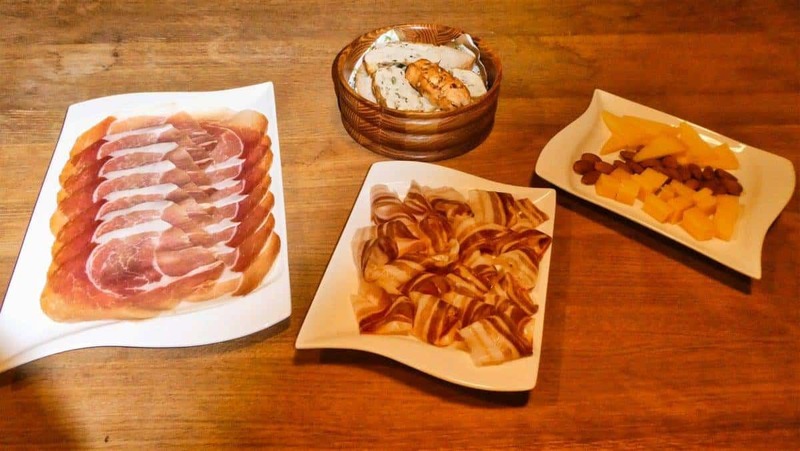 He shared his experiences with us, as we tried homemade cold cuts and, of course, enjoyed great wines. At Guerila the land is considered family. Because the land is Slovenian, they mainly grow indigenous varietals: Zelen, Pinela, and Rebula. They are also growing some international varietals like Zinfandel. By keeping crops small, Guerila ensures the best expression of the varietals and the land. 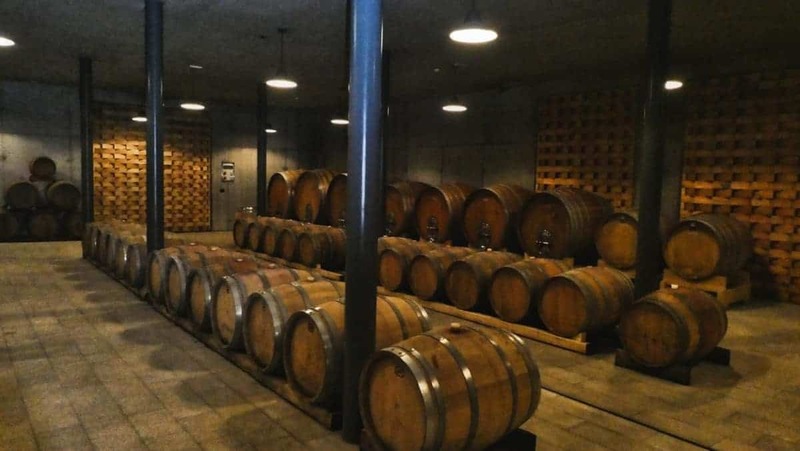 The winery with its tasting room and barrel room rivaled any of the beautiful tasting rooms in the U.S. 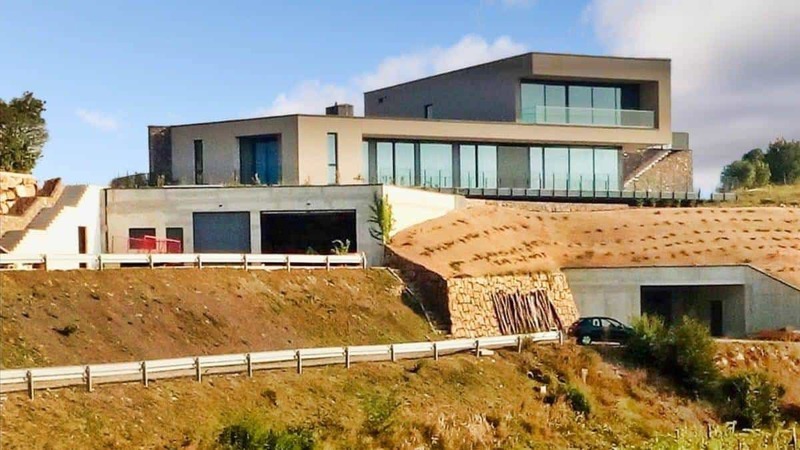 The owner built Guerila into a hill, to take advantage of the cool natural temperatures inside the earth. They made a tunnel through the hill to cool the barrel room through a means of automated ventilated doors. 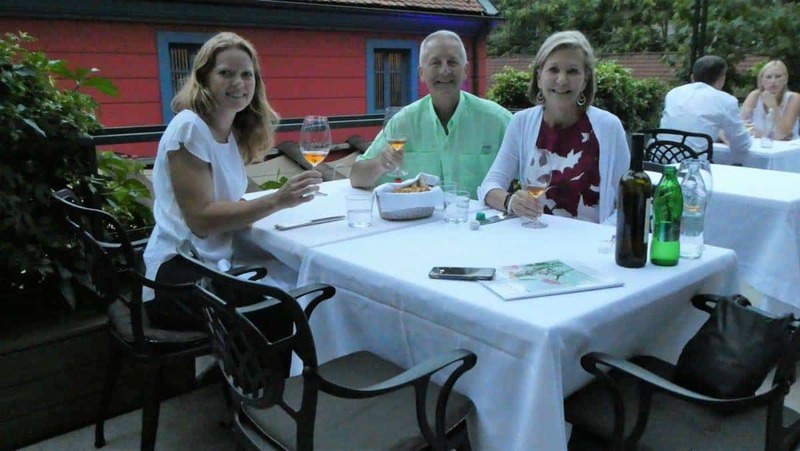 With our bellies full of the delicious flavors of Karst Slovenia wine region we returned to Ljubljana. We have dinner plans at Pope’s As Restaurant and our guide Mojka was invited to come with us. On the way back to Ljubljana, Mojka explains that As Restaurant is a Ljubljana institution, having been part of Ljubljana for over 30 years, and she feels Pope is a local Slovenian celebrity. When we arrive at the restaurant, the staff is waiting for us. We are ushered through the restaurant and upstairs to a lovely huge outdoor dining area where diners are drinking wine, chatting, eating and hoping that Pope will stop for a chat at their table. The three of us take a seat with Pope and shortly after that a waitstaff member appears with a bottle of Pope’s orange wine from his vineyard that we visited earlier in Karst. Pope orders dinner for the table. A large tree takes center stage in the al fresco dining area where we are seated. Pope explains that the tree has been there forever and that when they built the outdoor dining area, they decided to keep the beautiful old tree. He says the tree symbolizes evolution, tradition, assimilation, and family. 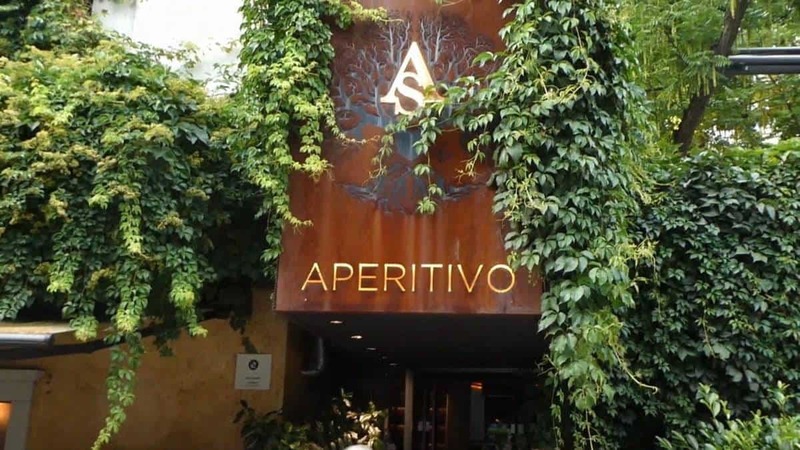 The tree has become the main symbol of the As Restaurant. The area is comfortable with a homey feel. We started our dinner with a couple of cold starters. 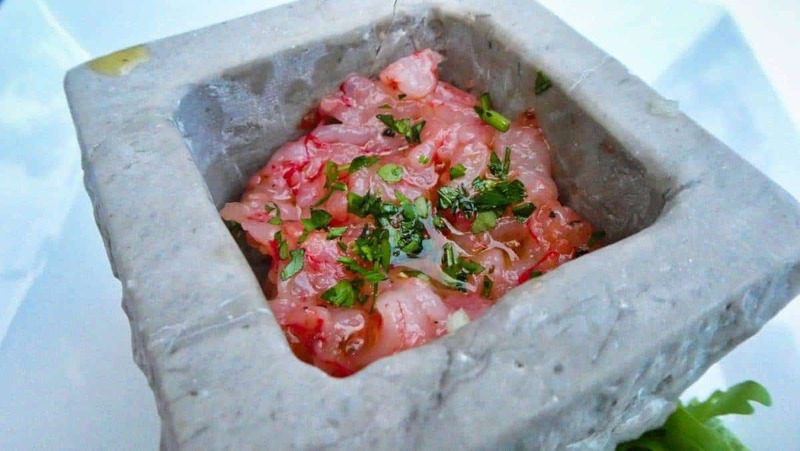 First was a perfectly spiced tuna tartare. After the starters, came three fresh seafood appetizers. Next was a shrimp soup. For the pasta course, we had a lovely four seafood dish with lobster, crab, caviar and bottarga (roe that has been salted, pressed and air dried). 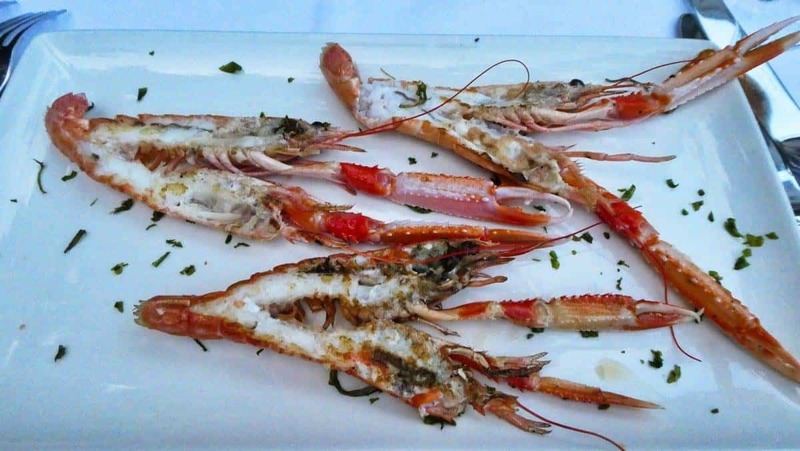 Then we moved to some already split Adriatic scampi. 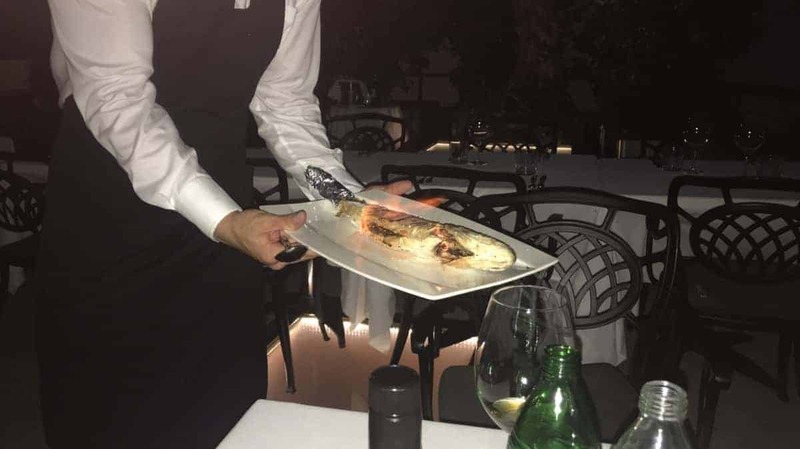 For the main course, we had an oven baked Adriatic wild fish. All of the food was fantastic. Needless to say, we did not leave hungry. Our dinner paired with an orange wine was the perfect way to end a perfect day. 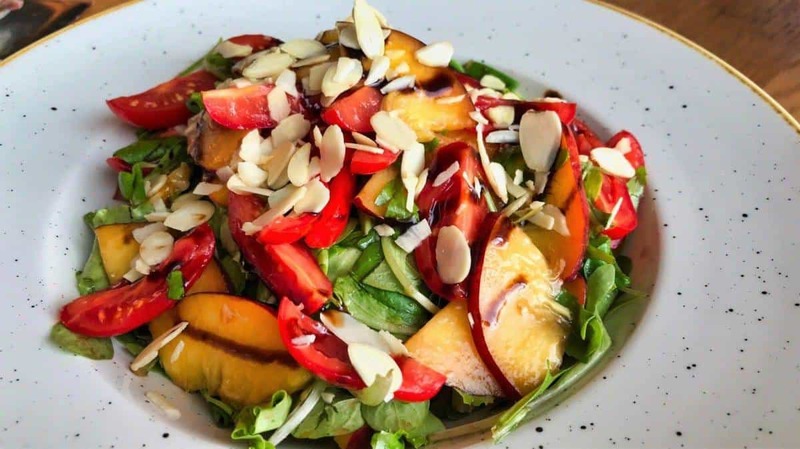 At the restaurant, Pope serves simple dishes made with high-quality ingredients. 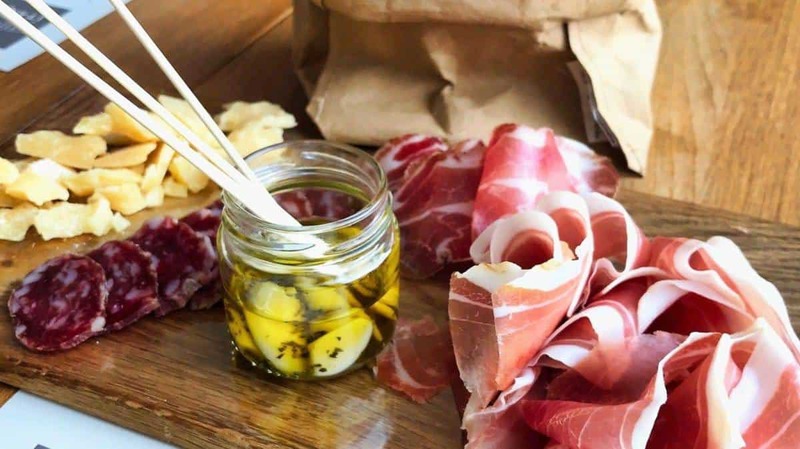 He always uses fresh Adriatic fish and first class aged charcuterie. When I said his dishes are simple they are, for seasoning his dishes; he uses olive oil and sea salt and occasionally some fresh herbs. Karst Slovenia is a lovely area. 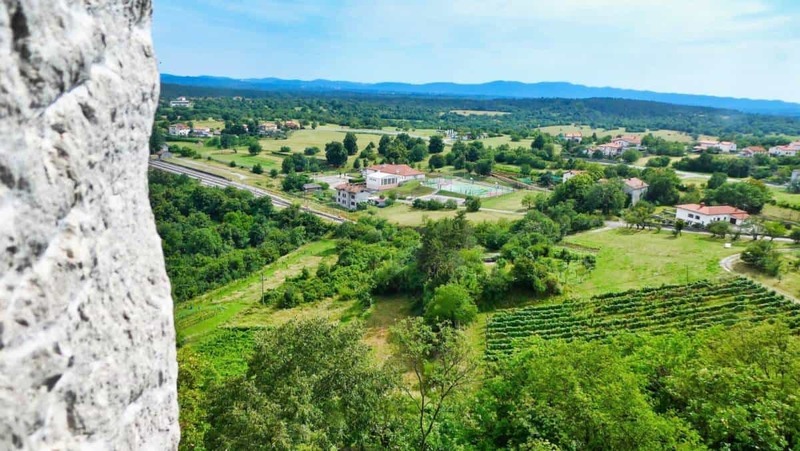 Nestled in the northwest corner of Slovenia with its rolling hills, limestone, and proximity to the Mediterranean Sea makes Karst a prime wine region. 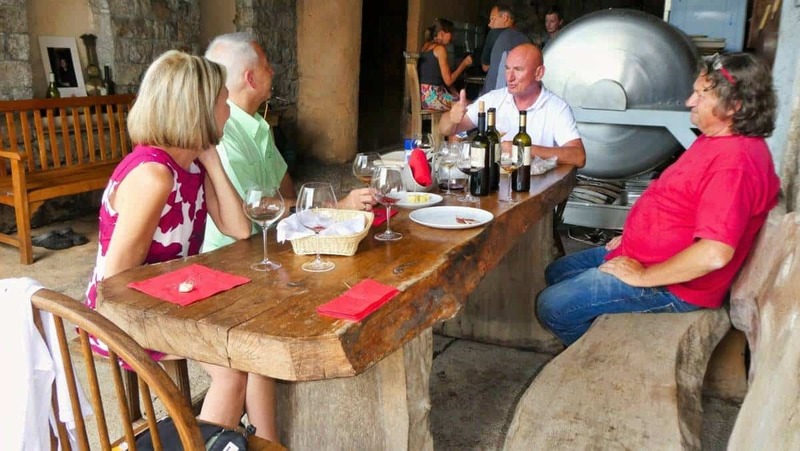 If you are a wine enthusiast, you must take a tour of the Karst Slovenia wine region. And we highly recommend Enjoy Slovenia with their vast experience of the region and knowledgable guides. And best of all, you don’t have to worry about driving. Instead, you can simply enjoy the wines. Enjoy Slovenia is the only Slovenian travel agency specialized in wine tourism: wine tasting tours, walk, wine and dine holidays. 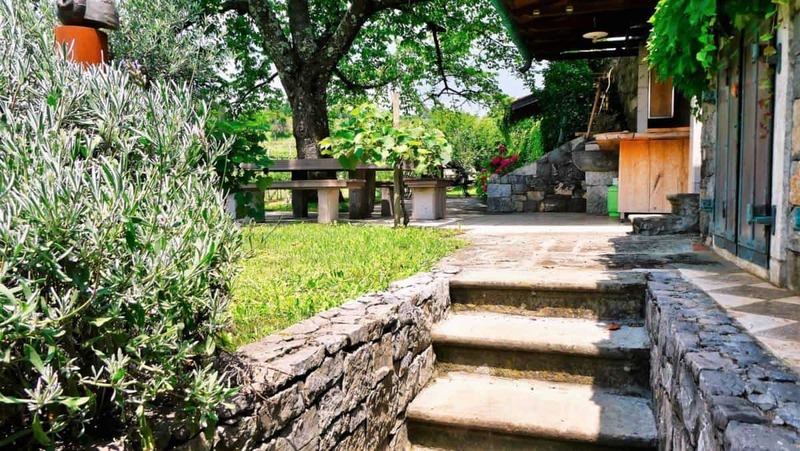 The wine tastings take place in the finest family run, boutique wine cellars in Slovenia. Enjoy Slovenia unlike others covers all the wine regions in Slovenia. You’re welcome and we are glad you found it useful. Hmm. 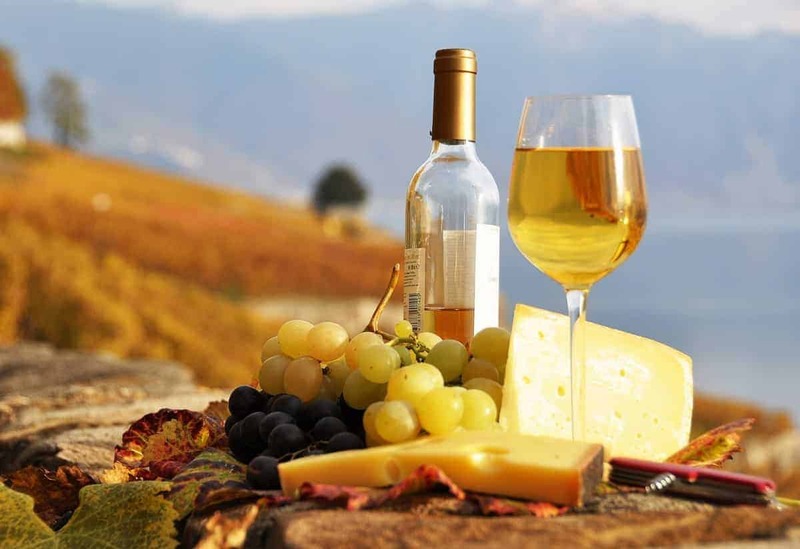 I LOVE wine – hmm a trip to Slovenia might be in order this Summer! We had some of our all-time best wines in Slovenia. We hope you get a chance to go.